There are plenty of books that discuss the evolution of mankind and it is not likely that Sapiens would have caught my attention in the bookstore. My colleague Amar at Shell recommended it to me, however, and he insisted that I would enjoy it. Amar was right. 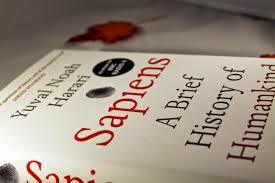 Harari describes the red lines of history in a simple and convincing manner. He provides a very useful framework to understand how we have all arrived where we are, as well the key developments to watch for the 21st century. The book starts at the point where our Neanderthals ancestors crawled planet Earth as an equal animal. He describes three critical revolutions that brought Sapiens from a species of many to world dominion: the cognitive revolution, the agricultural revolution and the scientific revolution. In the cognitive revolution, approximately 70,000 years ago, Sapiens developed the brain capacity for language. Why? Largely by pure evolutionary odds, according to the author. This enabled Sapiens to collaborate, which they desperately needed. Walking upright meant that humans grew small hips and childbirth accelerated, meaning that human babies were completely dependable for the first half year. It drove our social skills, as an isolated mother was not able to nurture her offspring amidst the dangers of the savage bush lands. It is the type of plausible logic that makes Sapiens an attractive read. The agricultural revolution happened approximately 10,000 years ago when Sapiens learned to domesticate animals. And how. In order to protect themselves, their chickens and cows, humans brought within some dozen millennia 100 out of 200 large terrestrial animal species to extinction. The book estimates that in the year 2000, the total animal mass of mankind and its domesticated species (cats, dogs, cows, pigs, chickens, etc.) is at least a hundredfold larger than all wild animals combined that are left. Harari identifies as an aside that today’s 25 billion chicken are from an evolutionary perspective more successful than 7 billion humans: chickens as the big winners of history. Finally, the combined industrial and scientific revolution have allowed Sapiens to master nature, create a global trade system and start engineering life itself. We have bio-engineered our domesticated species for a long time, mating cows is a huge science, and are now embarking on the engineering of human life itself. Harari describes this as the big singularity: the point where Sapiens has become so dominant and powerful that it has within its reach the ability to create a new Super-Sapiens. If you agree, like me, that this is indeed happening, then it raises some interesting questions for Perspectivity. What collaborative skills should we design into the superhuman DNA? Should we? How much empathy should we give them? Do we change how they feel happy or should we design them to be better able to achieve our view of happiness? Sapiens is a good read for those who like for example Bill Bryson’s A Short History of Nearly Everything and other books that describe the broad lines of history. If you go and read it, let me know, curious what you think of it.